Blow 'em out or blow it up, one of those outcomes will happen this saturday saturday saturday! blew one out, lost power steering, of all things! someone will be catching video for those of us too far away, yes? Good luck! Go fast, take chances!!! Ain't slowed down yet but I'm still alive and kickin' lol. and yes there will be PLENTY of videos. 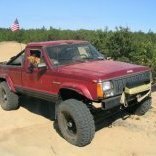 my 5.9 is gutless old turd, lol.